Ok,I admit it. I've spent something like more than one hour doing my beauty kit and, anyway, I have forgot something. I'm a human being, beauty obsessed and day-dreamer. 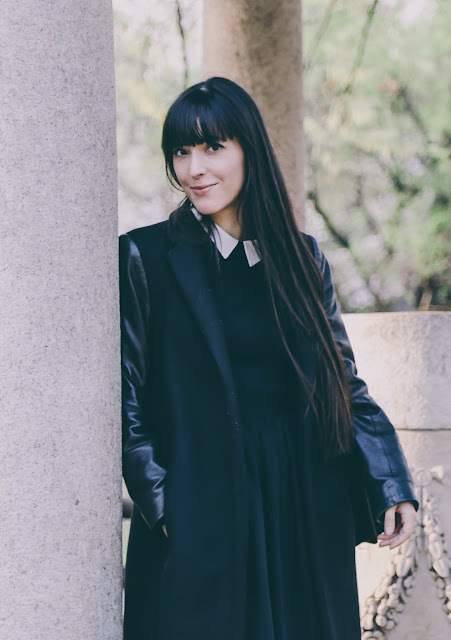 L'Oreal Paris Elvive Solar Defense Spray Protettivo (english: protective spray): perfect for the summer, it helps to protect my long hair from sunlight and makes them soft. Vichy Capital Soleil Mattifying face fluid dry touch spy 50+. 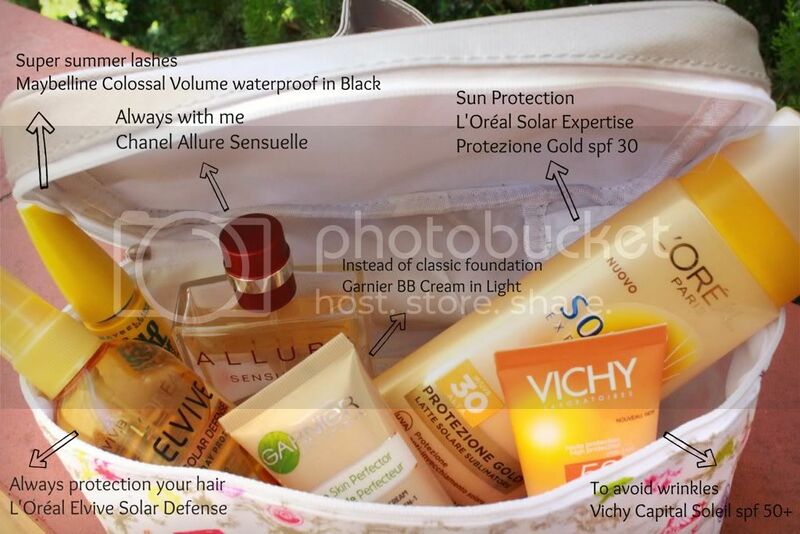 L'oreal Paris Solar Expertise spf 30 protezione Gold ( gold protection). Maybelline Colossal Volume Waterproof in Black. Chanel Allure Sensuelle eau de Toilette 100ml. 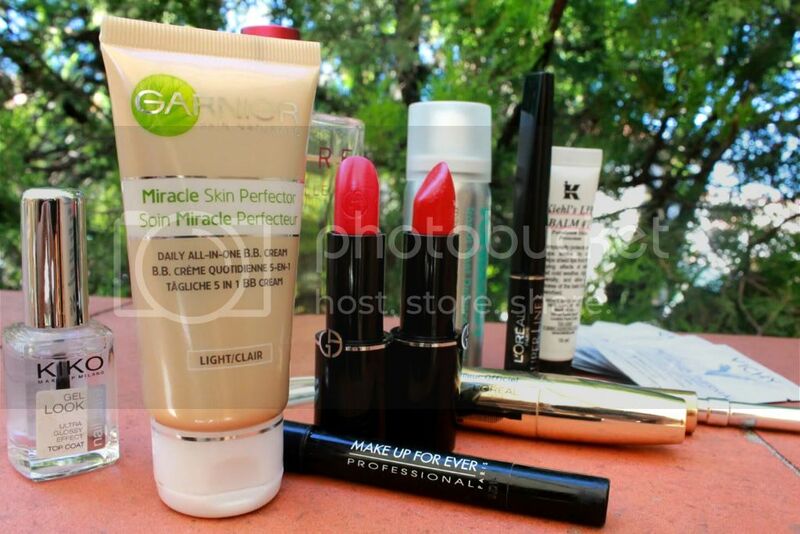 Garnier Miracle Skin Perfector BB Cream in Light. 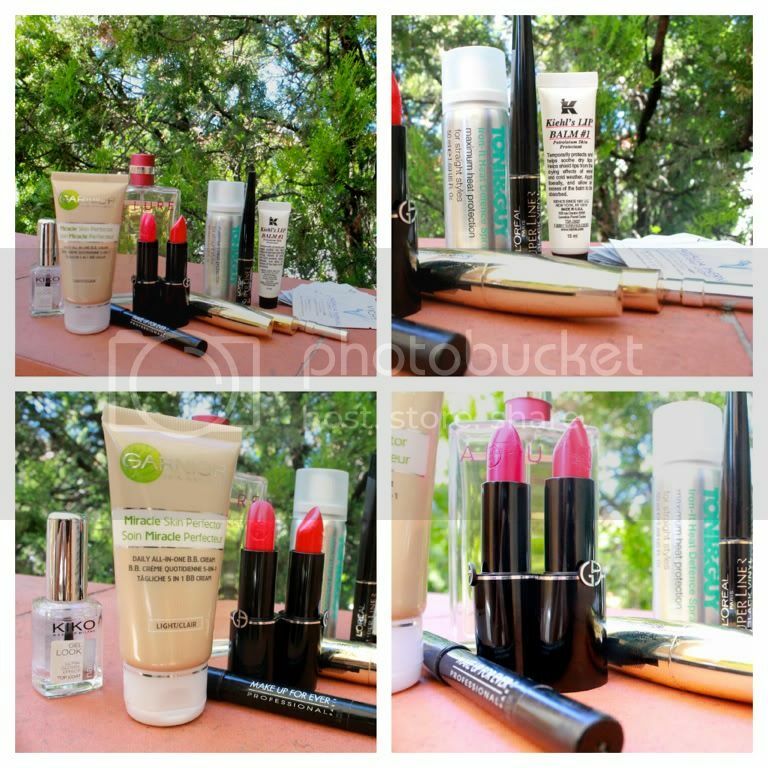 In my summer kit there is also space for make up, I decline it in a lighter version. The lipstick, one of my essential products, becomes sheer: Giorgio Armani's Rouge d'Armani Sheer Lipstick. Instead of eyeshadows I use Yves Saint Laurent as a base and Make Up For Ever's Aqua Shadow in Matte Black for a smokey eyes' effect. I keep using my L'Oréal Super Liner in Black and Volume Millions de Cils Mascara (Cannes Festival's edition). My eyebrowns pencil is Dior's Sourcils Poudre in Black (it isn't waterproof but it lasts). Nails: I know it's a pop summer for nails but right now, probably for the first time since years, I have just a clear nail laquer on. I use (alone or as a top coat) Kiko's gel Look Nail Laquer: it gives a gel effect and it helps colors to stay. I've read an article about clear nails on Elle Uk, probably on the August issue. I try to don't use hair dryer, but when I have to, I use Tony&Guy Heat Protection (this one is a travel size that I've bought in London, right now I think they have changed all their packages, so it may be different). Even if I have combined skin, during summer, especially after a super sunny day, I use Vichy's Aqualia Thermal (I put on my face for 5 mins and the I remove it with a cotton pad). From the same line there is also a proper mask, if you prefer! Anyway, even if I've spent all that time packing stuff, I've forgot something! My Roger&Galler Sublime Or body cream (perfect for tanned skin, it has sparkling glitters inside and an amazing fragrance). I replace it with L'erbolario Myrrhae Luminous Body Cream. I heard there is also an aftersun cream with glitter inside, I hope so because this one has a deep fragrance that remainds me to churche's smell. I've also forgot my lifesaver homeoplasmine cream (I use it for lips). I'm using Kiehl's lip balm, it is super good even id it gives a glossy finish to your lips. 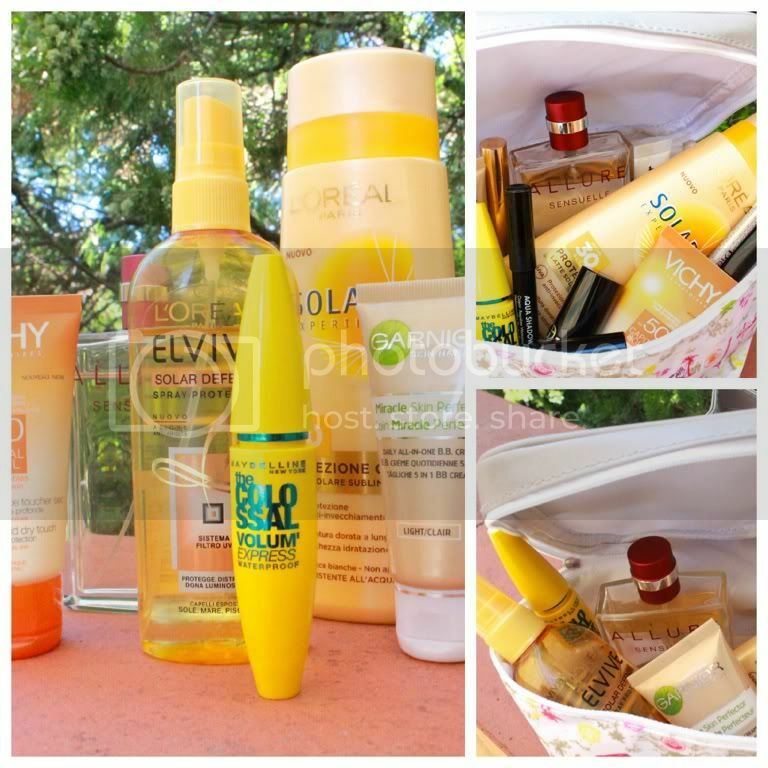 And now.. what is inside you summer bag?